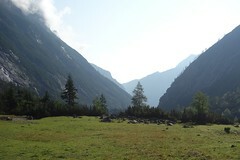 Yesterday, I left Garmish-Partenkirchen by bus at 0630. 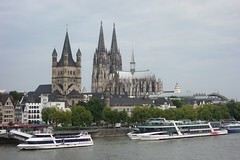 I changed buses in Munich, and finally arrived in Cologne at 1900. 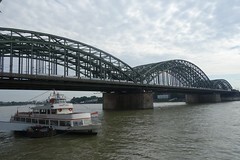 I unfortunately did not have time to see much of the city, but I had a fun time at the hostel hanging out with Freida, Rosie, and Adam, three university students from the UK. 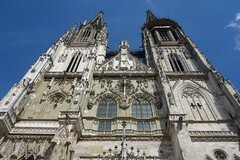 This morning, I had a few hours to walk around before I caught the bus to Brussels. 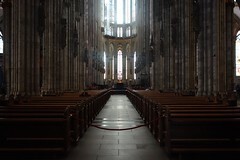 My first stop was Cologne cathedral. 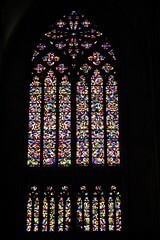 I really like this pixelated stained glass window. 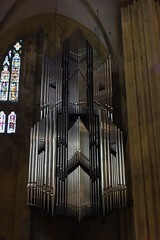 The organ case is suspended from the ceiling by four metal rods. 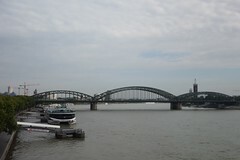 After leaving the cathedral, I headed down to the Rhine. 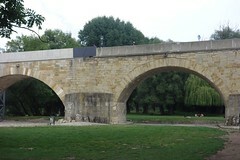 Here is one of the bridges across the river. 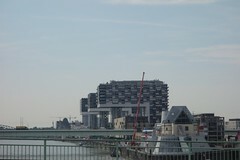 These unusual buildings jut out over the river. 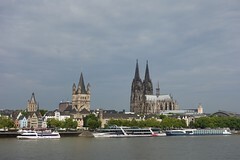 Finally, here are some views of Cologne cathedral from across the river. 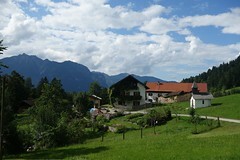 Yesterday, it rained most of the day in Garmisch-Partenkirchen. 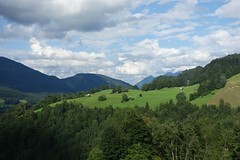 I considered packing my bags and heading to another city, but since I wanted to do more hiking, I stuck around for another day. 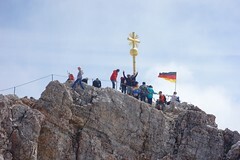 The forecast for today did not call for rain, so I decided to summit the Zugspitze, the highest peak in Germany (2962 m), via the Reintal route. I woke up at 0445, and was out the door by 0500. 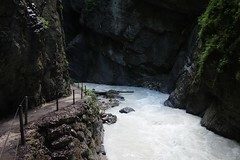 The route starts at the Partnach gorge, and as I was walking up the road to the gorge entrance, I met Andreas from Germany who was doing the same hike. 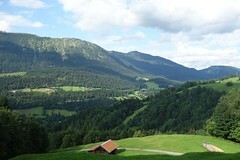 His English is about as good as my German, but we were able to communicate well enough and decided to hike up together. 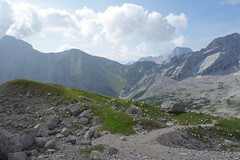 He set a fast pace which I was luckily able to follow, and we reached the summit by 1200. 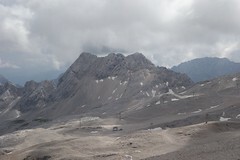 Stats for the hike: length 21 km, elevation gain 2254 m, time 7 h. I had a sausage and beer on the summit, and headed down via cable car and cogwheel train at 1400. 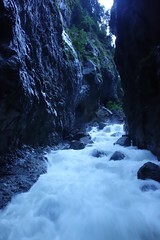 Here is the Partnach gorge in the early morning. 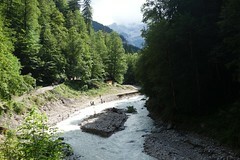 From there, the trail proceeded gently uphill following the Partnach river. 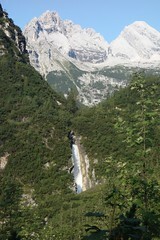 The trail went past a waterfall. 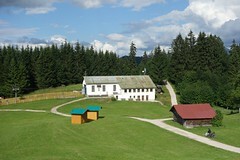 In this picture, you can see it faintly in the distance. 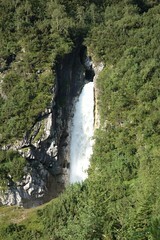 Here is the waterfall from a closer distance. 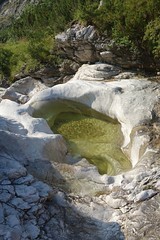 Near the top of the waterfall is a cool rock pool. 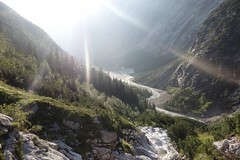 Here is a photo looking back down the (backlit) valley after climbing above the waterfall. 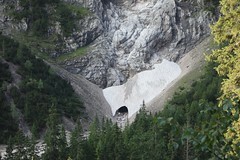 I also saw snow for the first time since winter. 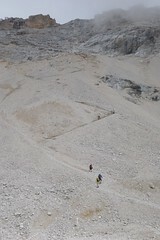 Shortly thereafter, we reached the Reintalanger hut. 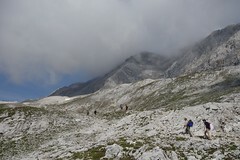 After a quick break at the hut, we continued our ascent. 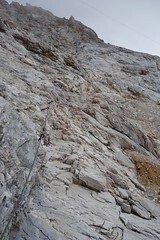 I could see that the trail was about to get much steeper. 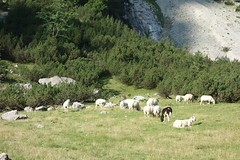 There were also sheep grazing near the trail. 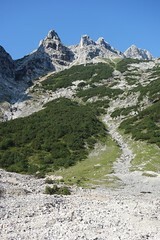 We then had to climb up this. 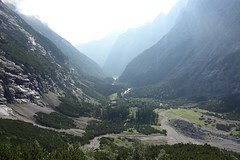 Here are some more pictures looking back down the valley. 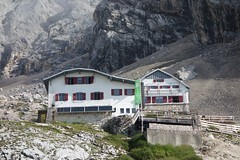 Eventually we reached the Knorr hut, where we stopped for a longer break. 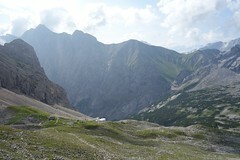 The trail continued its steep, rocky ascent past the Knorr hut. 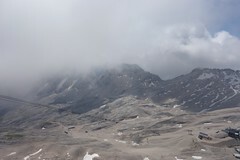 It also started to cloud up. 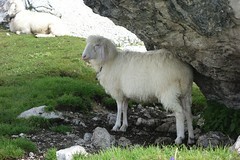 Where there is grass there are sheep. 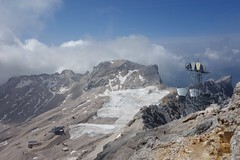 Here are some photos from above the Knorr hut. 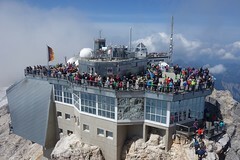 At the Zugspitze glacier, you can take a cable car to the summit of the mountain. 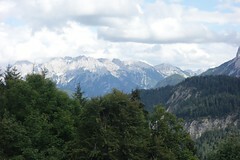 We opted to hike the rest of the way to the top. 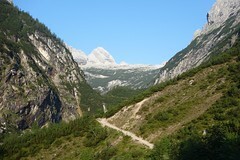 Here is the beginning of the final ascent. 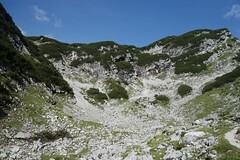 This was the most difficult portion of the hike; the trail was no more than an ill-defined meander through a talus-encrusted slope. 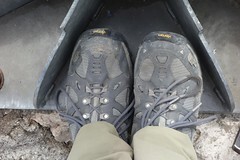 For every step I took uphill, I slid half a step downhill. 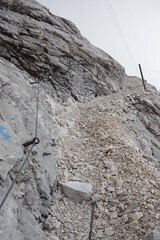 The trail got much easier when we reached the via ferrata. 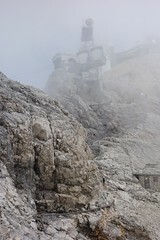 Even though visibility is not great, the end is in sight! 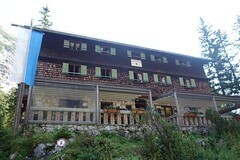 There are restaurants and bars at the summit. 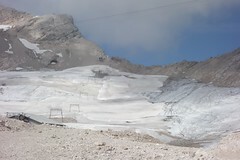 Here is the actual summit. 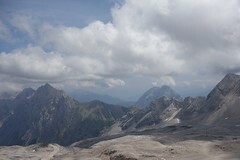 And some (cloudy) views from the top. 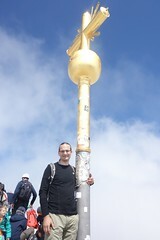 Finally, here I am at the summit of the Zugspitze. 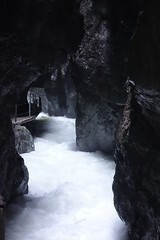 After dropping my bags off at the hostel in Garmisch-Partenkirchen, I set out to hike up the Partnach Gorge. 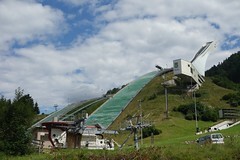 I took a bus from the tourist information center to the Olympic skiing stadium. 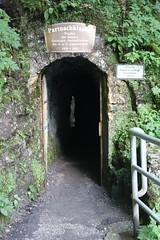 From there, it was a short walk uphill to the entrance of the gorge. 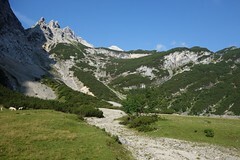 The Partnach Gorge hike is (deservedly) one of the most popular hikes of the region. 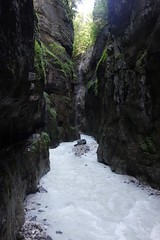 The gorge is about 800 m in length, and the walls rise 80 m high on either side of the Partnach river. 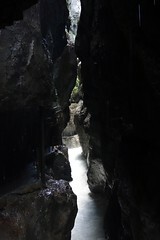 At its narrowest, the gorge is only a few meters across. 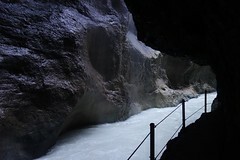 The trail consists of ledges and tunnels which wind up the side of the gorge. 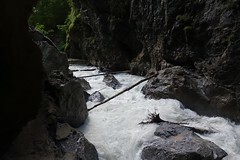 Small waterfalls cascade down the sides of the gorge, and it is impossible to complete the hike without getting at least a little wet. 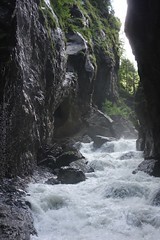 Here are some more photos of the gorge. 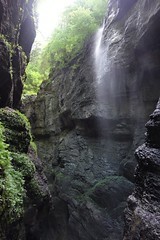 At the top, the gorge opens up into a wide valley. 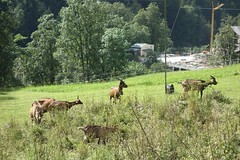 I continued to hike uphill towards Eckbauer. 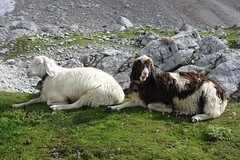 On the way, I passed these goats high on a hill, but I did not see a lonely goatherd. 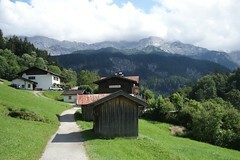 When I got to Eckbauer, I got some lovely photos of the alps. 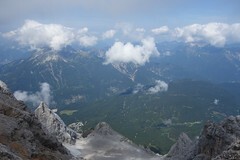 So I hiked down instead. 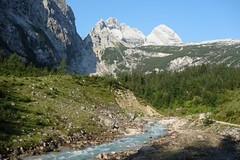 From Regensburg, I set out for Garmisch-Partenkirchen in the Bavarian alps. 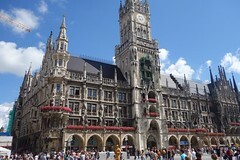 I had to change trains in Munich, and since I had a Bayern ticket, which gave me unlimited travel in Bavaria for one day (including the Munich S-Bahn), I decided to duck into Munich for a few hours. 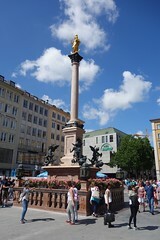 From the Munich train station, I took the S-Bahn two stops to Marienplatz, the central square of the city. 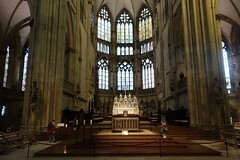 Unsurprisingly, it was packed with tourists. 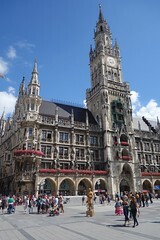 This is the new town hall, built in the Gothic revival style. 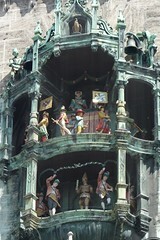 Every day at 1100 and 1200, these figures move around the clock tower to the accompaniment of a mechanical glockenspiel. 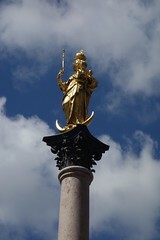 This is the column of St. Mary. 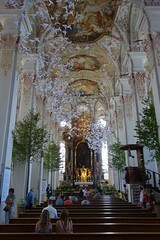 In the Heiliggeistkirche, there is an installation entitled "Garden of Eden 2014" featuring lots of trees and paper birds. 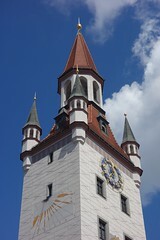 Finally, this is the zodiac clock tower on the old town hall. 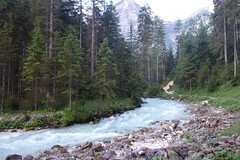 I would have spent longer in Munich, but the weather was nice, and I really wanted to get to Garmish-Partenkirchen so I could get in some hiking before nightfall. 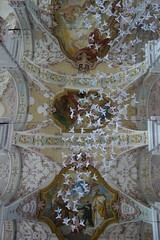 I slept terribly my last two nights in Salzburg. Friday night, three tourists from [redacted] barged into the room at 0130 and spent an hour unpacking all their stuff, only to spend another hour repacking all of it at 0630. Saturday night there was epic snorer, who could be heard even through earplugs. 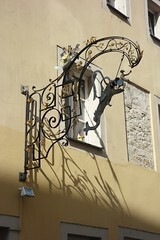 While in Salzburg, I decided to plan the last two weeks of my vacation, mostly to avoid the troubles I'd had getting last-minute hostel beds (especially on the weekends). 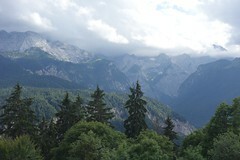 I will be spending those weeks in Belgium and the Netherlands, and have timed my arrival in Brussels to coincide with outdoor Scottish Country Dancing, sponsored by the local RSCDS branch. Hopefully the weather will cooperate. 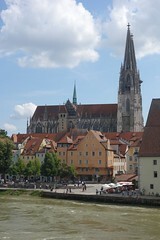 From Salzburg, I took two local trains to Regensburg, located about 80 km north of Munich. 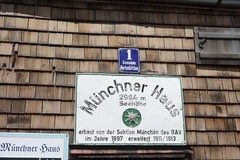 When I arrived around noon, the only other person in my hostel room was a middle-aged gentleman who was drinking beer from a large plastic bottle and looked like he would be a loud snorer. The person working at the reception desk kindly allowed me to switch rooms, and I was finally able to get a decent night's sleep. 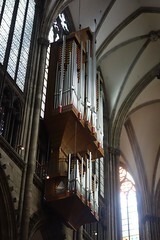 I arrived at the Regensburger Dom at the conclusion of mass, just in time to hear the organist play Jehan Alain's Litanies, which I had used as an audition piece way back in 2000. 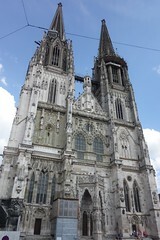 It was hard to get enough distance to take exterior photos of the cathedral. 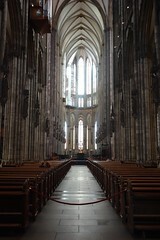 Here is the interior of the cathedral. 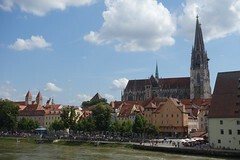 After visiting the cathedral, I crossed the Danube on the historic stone bridge which dates from the twelfth century. 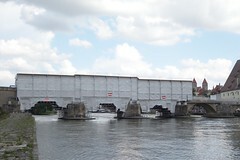 The bridge is currently being restored. 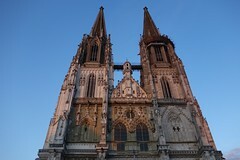 I got some lovely pictures of the cathedral from the bridge. 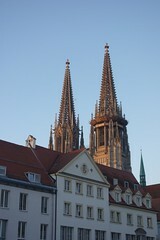 Finally, here are some photos of the cathedral towers at sunset. Python microframework by Flask. Inline mathematics by MathJax. Web hosting by WebFaction.